Premiering in Minnesota tonight at the Walker, 7:30pm with an intro and Q&A with director Lynn Hershman Leeson, and several more screenings this weekend. 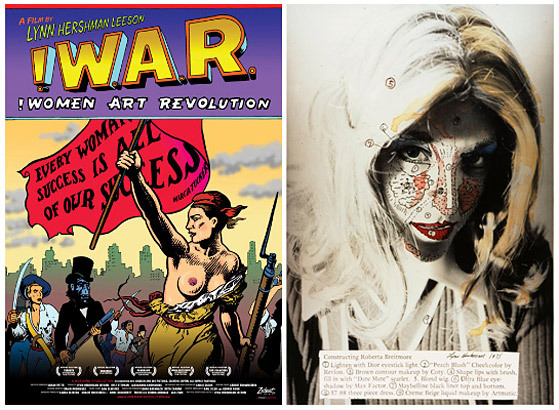 The Walker Art Center is Screening !WAR: Women Art Revolution this weekend. At the same time, the Katherine G. Nash Gallery at the University of Minnesota Regis Center for the Arts is holding an exhibition featuring work by the film’s director, Lynn Hershman Leeson. I’ve been waiting eagerly for this ever since the film’s trailer came out last spring. Hershman is speaking both at the opening reception at the Nash on Thursday and at the Friday night screening at the Walker. The film is 40 years in the making, detailing the evolution of the feminist art movement in the United States since 1968. More info on both these events with a much better description than I could write can be found here. There is also a free event for women artists in Minnesota at the Walker on Saturday from noon-5pm called MN Women Artists Talk Back which includes assistance with digitizing artwork and setting up an mnartists.org online artist portfolio. 40 years in the making is an impressive time frame. I hope that it travels so that I can see this.